Our purpose is to provide the best quality care and to educate each child in Christ-centered surroundings. We nurture and encourage each child in development of spiritual and moral values, as well as social and cognitive skills. Our sharing and caring, in Christian love, creates an environment in which each child can grow and feel safe and accepted for his or her own individuality. Download Our Childcare Handbook! Click Here! At Gloria Dei Lutheran Preschool & Child Care we know how important the early years are in a child’s development. We consider our infant and toddler caregivers as “educators”, as they carefully blend the responsibility of providing the highest quality care and security to your child within a Christian setting, while at the same time offering your child a learning experience through everyday activities. Our educators design daily routines that focus on supporting and nurturing the developmental stages that each individual child is experiencing. Our caregivers will provide a daily written report of your baby’s feeding, sleeping, diapering and learning activities. Our play areas are designed with plenty of room for exploration and movement and are filled with carefully selected toys and books designed to positively affect all areas of your baby’s development. We are committed to making this first transition away from home natural and easy for both the parent and child. 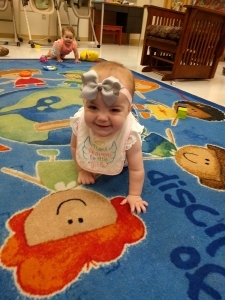 Our Early Learners Program is designed to help the child explore their world and learning to communicate their thoughts and feelings in a Christ centered atmosphere. As they begin to exert their independence, they are also gaining a better understanding of what it means to play with others. Our program will keep their small hands busy and their minds engaged through countless activities focusing on both educational fundamentals and social skills development while developing a love for Jesus. Through play in small and large groups as well as alone your child will engage in activities that will help them grow in cognitive, language, social and physical development while learning to get along with others. Our classrooms are filled with an assortment of learning resources to include age appropriate information technology and books about the world and Christ, so your child can access and enjoy them throughout the day. We know that children who learn to love books from an early age are more likely to become successful learners and lifelong readers. Our teachers make reading together a top priority, and your child will benefit from many rich and varied conversations surrounding these stories and books. They will learn and experience first hand, through their teacher, the fullness of the love God has for them through Jesus Christ. In this stimulating, fun and caring educational daily program, your child will also be able to keep physically active through a myriad of daily fun and challenging physical activities and games. 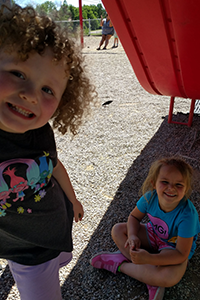 We schedule outside activities, weather permitting, in our outside “Early Learners” playground which contains “rubberific” mulch. When not able to go to the outside playground they will have planned activities in our full size gymnasium. Our Pre-Kindergarten program has been designed specifically so your child can investigate, explore, ask questions and take initiative for learning about the world. Our warm Christ centered educationally focused classrooms are equipped with information technology and will allow your child hands-on math, science, and social studies activities that will interest them and arouse their natural curiosity. Our teachers will be there to guide, support and challenge them, answering their questions and nurture their love for learning. Throughout the Pre-Kindergarten year, we will provide a multitude of opportunities and activities designed to not only increase your child’s vocabulary and improve their listening skills, but also to present them with a wide background of knowledge about our world. We will also provide your child with a multitude of print experiences designed to assist them with moving easily into reading. Your child will not only learn the importance of keeping physically active but will also learn about good nutrition. In addition to this stimulating and fun educational daily program, we schedule outside activities, weather permitting, in our outside fenced in playground area for 4 and 5 year olds. When weather does not permit the outside activity, they will have the activities that are planned in our full size gymnasium. Our goal is to ensure that your child will be Kindergarten ready in accordance with Kentucky state guidelines. 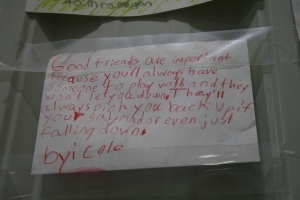 We provide after-school care for elementary age students. 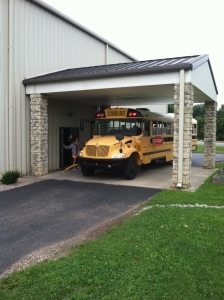 Students are bused by Hardin County from Heartland and G.C.Burkhead Elementary Schools. Parents are responsible for transportation from other schools. We provide a snack, devotional time, planned activities, quiet time for homework (where they will receive help as needed) indoor/outdoor play and choices for free time activities. Full-time child care – Available for children from the ages of 6 weeks to 5 yrs. from 6:30 a.m. to 6:00 p.m. Monday through Friday. All 3- and 4-year-old children enrolled in full-time care are automatically enrolled in preschool. There is no extra charge for preschool as the cost is included in the weekly fee. Preschool – Available to children ages 3-5 from August through May. 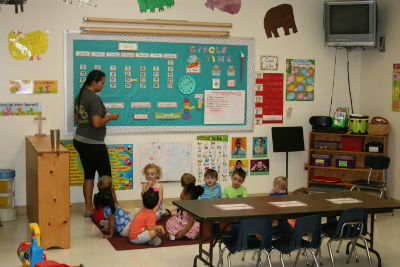 The preschool meets between 9:00 a.m. – 11:30 a.m. Tuesday through Friday. 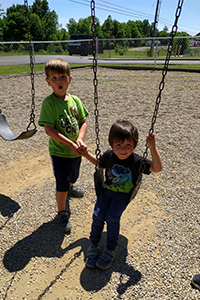 After School Care and School Break Care – available for grades K-5th or age 12. Hardin County busing is available for children from G.C. Burkhead and Heartland when school is in session. Summer Camps – available for grades K-5th or age 12. We are unable to provide drop-in or hourly care due to staff/student ratios. Care required due to an emergency must be arranged with the Director.